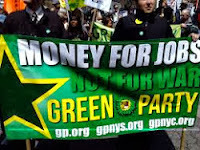 We write to reaffirm our commitment to building a Green Party that has a radical analysis of the society in which we live, and promotes bold solutions to transform our society and address the root causes of those crises; a Green Party that is independent of the two money-dominated parties. There is a deep social crisis in the US. This crisis manifests in countless ways. One of its central manifestations is through the political system. People have legitimate concerns about the electoral system, which is manipulated through wholesale voter disenfranchisement, massive voter suppression and the racist and undemocratic historical logic of the Electoral College. In all fifty states, voters from poor and marginalized communities, especially Black people and other communities of color, have their votes suppressed and are excluded from participation through various practices. The Green Party cannot build the political power necessary for the transformative changes we need by allying with two capitalist parties that serve the interests of the wealthy. That is why it is imperative that the Green Party is independent of those parties. We stay independent to give people an alternative to the corruption of two money-based parties. Greens reject donations from corporations and their political action committees to ensure we are accountable to the people and so that the people’s agenda is not superseded by the corporate agenda. There are significant electoral reforms needed to make elections more democratic and more representative of the people. While we support electoral reforms, including how the vote is counted, we do not support the current recount being undertaken by Jill Stein. The decision to pursue a recount was not made in a democratic or a strategic way, nor did it respect the established decision making processes and structures of the Green Party of the United States (GPUS). The recount has created confusion about the relationship between the Green and Democratic parties because the states chosen for the recount are only states in which Hillary Clinton lost. There were close races in other states such as New Hampshire and Minnesota where Clinton won, but which were not part of the recount. And this recount does not address the disenfranchisement of voters; it recounts votes that were already counted rather than restoring the suffrage of voters who were prevented from voting. As a candidate, Dr. Stein has the right to call for a recount. However, we urge the GPUS to distance itself from any appearance of support for either Democrats or Republicans. We are well aware of the undemocratic actions taken during the primaries by the DNC and the Clinton campaign. Greens cannot be perceived to be allied with such a party. We remain committed to the Green Party’s four pillars and ten key values, which have at their foundation grassroots democracy. We urge the GPUS to prioritize its efforts on building our party from the bottom up, working and organizing in direct solidarity with our state and local parties and alongside and in defense of the rights of those most affected by the injustices of a capitalist, white supremacist and undemocratic system. This includes support for local efforts to prevent the disenfranchisement of people of color via voter suppression or because of felony convictions and to be more inclusive and participatory in our decision-making processes and work. Jill here - I am writing to share my thoughts with you as we grieve together this morning after Donald Trump’s election. I want to acknowledge the very real pain that so many Americans are feeling. We cannot and will not concede to what a Trump presidency represents for people of color, women, immigrants, Muslims, LGBT folks, the poor and working people. We call on all Americans to stand together with oppressed communities and demand that Trump respect the human rights and dignity of all people in our society and our world. We must stand with people of color, with immigrants and Indigenous people, with Muslims, Jews, LGBTQ people, women, and all whose rights are threatened. Solidarity must be our guiding principle. This bitter election has left the overwhelming majority of Americans feeling disgusted. Polls show a large majority of voters were motivated by fear of the other candidate, not support for their candidate. This is another symptom of a democracy on life-support. Many are rightly outraged about the DNC’s sabotage of Bernie Sanders, who by all indications would have trounced Donald Trump. We must also recognize the leading role played by corporate media in turning this election into a toxic reality show. The media elevated Trump at the bidding of the Democratic National Committee - and to boost their own advertising profits. They also marginalized Bernie Sanders, and massively silenced our campaign and Gary Johnson’s in a year when Americans were screaming for more choices. And they legitimized corporate-controlled debates that locked out political competition. One study found that our campaign received 3 seconds of coverage on corporate media for every 1,700 minutes for Trump and every 1,000+ minutes for Clinton. We urgently need to support independent media whose only agenda is informing the public of the truth. In spite of all the barriers to our participation, we earned over one million votes for peaceful revolution, more than doubling our vote count in 2012. The anti-establishment revolt we’re witnessing is driven by very real suffering in our country. High real unemployment, falling real wages, lack of affordable healthcare and education have devastated our communities, while both establishment parties have pushed corporate trade deals, wars for oil and Wall Street bailouts to enrich the elite. The anger at economic inequality is easily manipulated to divide the people against each other. We must revive American democracy, if we are to stop our descent into authoritarianism. One of the most hopeful developments is that Maine has become the first state to pass ranked choice voting, which also won in Benton County, OR. Ranked choice voting could end fear-driven voting and reverse the race to the bottom that our elections have become. Greens also worked hard to pass statewide initiatives calling for a constitutional amendment to abolish corporate constitutional rights and the concept that money equals speech in Washington and California. We must build coalitions for democracy reforms including the replacement of the electoral college with a national popular vote, ending corporate constitutional rights, public election financing, and free public airtime for candidates to counter the corporate media’s failure to inform the public. The Green Party also continued its long record of electing grassroots candidates to local office, with Greens winning 10 elections in California, 5 in Michigan and 3 in Minnesota. I congratulate all our local candidates and volunteers - you are the heart and soul of our party. It’s clearer than ever that America desperately needs a principled alternative to the predatory political establishment. I hope you will continue as an invaluable member of our team, working with myself, Ajamu and all of our campaign - as we continue the work of building a party for people, planet and peace over profit. We must work as if our lives depend on it. Because they do. This campaign is not ending. To start with, we will be supporting actions against the Trans-Pacific Partnership, as part of a series of protests in Washington DC from Nov 12 - 17. We will be building Occupy Inauguration protests in January. Throughout the coming year we will be organizing campaign schools and trainings for new candidates. We will also be organizing campaigns to enact Ranked Choice Voting in the presidential race, and for a People's Presidential Debate Commission - to replace the repressive bipartisan Commission on Presidential Debates - for the election starting in 2020. So stay tuned. Take care of yourself and your loved ones. Don’t mourn - organize. And keep fighting for the greater good. Together we will create an America and a world that works for all of us. The power to create that world is not just in our hopes. It’s not just in our dreams. It’s in our hands. I consider myself a Marxist. However, the term "Marxist" is merely a label. Those who ascribe to the tenets of Marxist thought must place their political affiliations within the context of the current historical moment. Anti-communism and imperialist hegemony have set back the struggle for a classless society to the point where much of the US left is mired in confusion as to what political direction should be taken to confront the challenges before us. One of these challenges is the 2016 elections. The radical left should plan on voting Green this November and building a mass movement around the demands put forward by the Jill Stein and Ajamu Baraka campaign. But the corporate assault on the left's collective consciousness has indeed made it difficult for the Green Party to grab the attention of the masses in the midst of the two-party capitalist circus. I myself argued two summers ago that the left in the United States should not bother with engaging the charade and instead take up a boycott of the Presidential elections. At that point, no movement had emerged to challenge the hegemony of the Democratic Party. The 2016 elections changed this dynamic. Suddenly, the forces in front of the Occupy Wall Street movement and the Black Lives Matter movement agreed that both corporate candidates were unworthy of support. The energy of these movements was channeled into the Bernie Sanders campaign. Sanders ran as a Democrat. His domestic positions on education, healthcare, and income inequality were supported by masses of young voters. Sanders eventually betrayed his base in typical Democratic Party fashion, but not before it was revealed that the Democratic National Committee had worked diligently to undermine Sanders' ability to win the nomination. The majority of Sanders supporters and sympathizers have since indicated that they will not vote for Clinton when election day arrives. 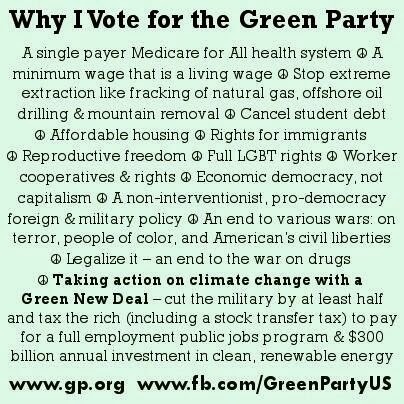 So why vote for the Green Party in particular? 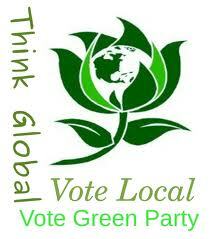 The Green Party is the only choice that possesses a truly social democratic agenda. The Green Party is no Marxist vehicle and it doesn't attempt to be. 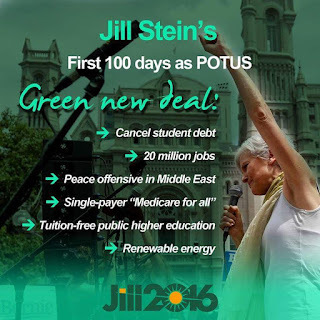 What the Green Party does possess are dedicated, principled forces whose positions on war and peace, healthcare, and predatory capitalism threaten the US imperialist apparatus. That is why the two-party corporate duopoly finances its own corporation to bar the Green Party from entrance into the Presidential debates every four years. In the 2016 elections in particular, a real chance was present to organize the 15 percent of pollsters necessary for the Green Party to participate in the corporately controlled debates. The opportunity was squandered by a left that remains weak and fractured. In the past, attempts to organize an election boycott campaign or support a communist party's Presidential nomination would have sufficed as election strategies to steer the disillusioned populace toward movement politics. However, the 2016 Presidential election is a watershed moment in US imperial history. Hillary Clinton has drawn the entire ruling class into the Democratic Party tent. This has occurred in the midst of the greatest crisis of legitimacy the US imperial state has ever faced. Sanders and Trump shook the foundation of the two-party corporate duopoly. The rise of Sanders and Trump made the Clinton option desirable only to the ruling class and its minions. Both corporate media and capitalist enterprise supported Clinton's bid to steer the election in her favor. Not only did the ruling class help her take out Sanders, but it also assisted Clinton in a cover up of the recent WikiLeaks email dump. In emails written by her campaign chair John Podesta, it was revealed that the Clinton campaign planned to use the Trump campaign as right-wing cannon fodder to present Clinton as more electable. Furthermore, the emails also uncovered how Clinton holds a "public" and "private" position on matters of Social Security and free trade. If left up to Clinton, Social Security retirement benefits and federal regulations of corporate activity would be swept into the dustbin of history. Additionally, the corporate media and the Democratic Party have attempted to frame Donald Trump as a racist, misogynistic pig. According to the Democratic Party, Trump represents the "Worst of America." The slander of Trump has been an easy job. Trump himself provides all of the ammo. However, the condemnation of Trump is little more than a convenient distraction when it comes from the corporate Democrats. From Bill Clinton to Barack Obama, the Democratic Party has waged endless war, austerity, and racist state repression on behalf of its corporate masters. Hillary Clinton must resort to fear-mongering around Trump because neither her party nor her class has anything to offer the majority of the US electorate. Conditions are thus ripe for an alternative political party to make a strong showing in this and future Presidential elections. The Green Party's success could inspire the millions of people disillusioned with both choices and show that a mass sentiment against the two-party corporate duopoly does indeed exist. It is the task of communists, radicals, and revolutionaries to organize the disaffected into a class conscious organization capable of stripping power from the ruling class. No such organization exists at the moment. The Green Party doesn't profess to be this organization, but its demands and platform are surely helpful if utilized to create the conditions required for such an organization to emerge. So when self-identified leftists make the claim that the left deserves better than Jill Stein, the urgent need for self-criticism becomes clear. One only needs to examine conditions in the US briefly to see that oppressed and working class people deserve better than the left. Of course, the left's current state is a reflection of the conditions from which it exists and the deep imperialist assault on the consciousness of the oppressed. However, the left has made critical errors in recent years. Many so-called revolutionary organizations have, for example, supported imperialist war in Libya and promoted the notion of lesser evil voting as cover for the Democratic Party. 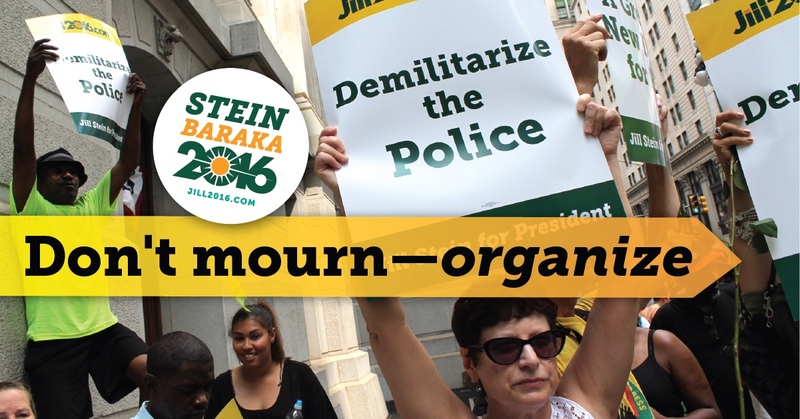 Green Party candidates Jill Stein and Ajamu Baraka have consistently stood up against endless war, austerity, and racist state repression and for universal healthcare, education, and peace. Yet there are some who want to claim that such a platform is not adequate or "revolutionary" enough. It is time to shed this sectarian way of thinking. Hillary Clinton will become the next President of the US. She will inherit the eight years of Obama rule which have further weakened the left. But the 2016 elections have revealed that the deep crisis of the imperialist system is beginning to intersect with popular opposition to its policy manifestations. So don't fear Trump or organize resistance in a manner that gives the people a choice of either revolution or nothing at all. There is nothing counterrevolutionary about voting Green this November and organizing the movement on the streets around its core demands. As BAR’s Bruce Dixon noted last week, a five percent showing by the Green Party will put much needed federal funds into the control of movement organizers. A revolution is not a moment, it is a process. The crisis of imperialism will present many more moments to develop the revolutionary potential of the masses. The current opportunity to do so should not be allowed to dissipate, as the next moment could occur alongside a Hillary Clinton-led world war. A world without dirty fossil fuels is possible. So is a world without wars for oil. We know this because of the hours of research our policy advisors invested in creating our campaign’s signature plan to revitalize the economy and halt climate change while making our imperialistic wars obsolete. This ambitious plan is called the Green New Deal. Building on the concept of Franklin D. Roosevelt’s New Deal, the Green New Deal will create up to 20 million jobs by calling on communities, government and ordinary people in a wartime-scale mobilization. We’ve created a page dedicated to answering your questions about how the Green New Deal will transition the United States to 100 percent clean, renewable energy by 2030 and help create full employment throughout the country. No more unemployment offices—we envision a world with employment offices. When we invest in renewable energy, our economy will be revitalized and our national security will no longer be vulnerable to disruption of oil supplies. The Green New Deal pays for itself within a matter of years by preventing chronic disease, which consumes a staggering 75 percent of our $3 trillion in annual health care costs. The Green New Deal is a blueprint for a secure, just, green future for all of us. P.S. Find out how the Green New Deal can transform the United States for the greater good.